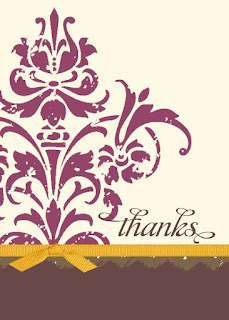 My Digital Studio is the most amazing paper crafting tool! With this tool you can create gorgeous scrapbook pages and scrapbooks, cards, calendars and more! I've been playing with mine for a few weeks now and can't believe how fun and easy it is to use. You can use the templates that are already created in the program or make your own. There are many stamp sets, embellishments, designer papers, scrappin' kits and more to use to make your projects come to life! I'm telling you, it's amazing! Here are a couple of samples that I have made. 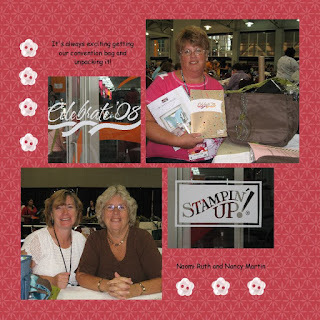 The first an 8x8 scrapbook page, the other a card. This software is well worth the price. During October and November, you can get this awesome tool for 50% off by submitting $400 in orders. You can do that by hosting an in home workshop with me or collecting orders and submitting them to me. In order to receive the special price, I need to submit the order. Email me dflever@comcast.net . Put this on your Christmas lists! I have gift certificates available. If you have questions, please email me. 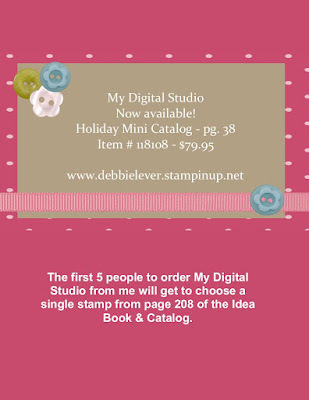 Remember, the first 5 to order My Digital Studio from me will get to choose a single stamp from page 208 of the Idea Book & Catalog. Email today!